Apple's fleet of vehicles collecting street-level mapping data has arrived in the United Kingdom as planned, with the first verified sighting in Solihull, England, approximately two hours northwest of London. 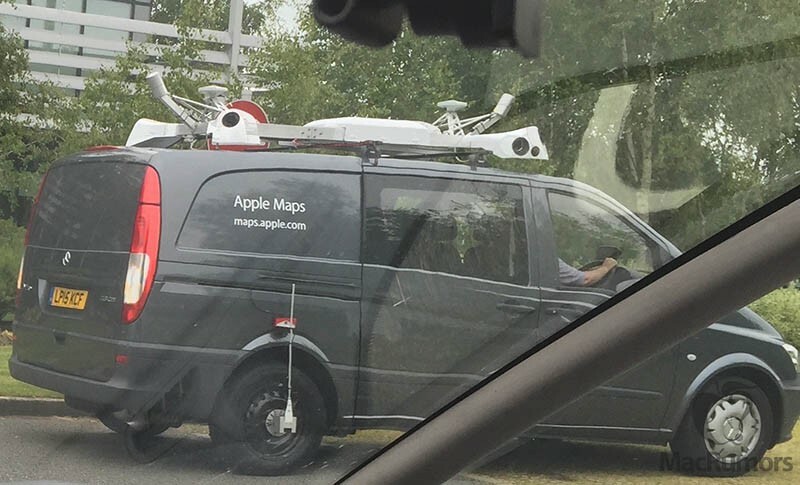 While camera-equipped fifth-generation Dodge Caravans have been used to collect mapping data in the United States, Apple appears to be using Mercedes-Benz Vito vans marked with "Apple Maps" in Europe. Apple confirmed earlier this month that it is driving vehicles around the world to collect data to improve Apple Maps, and the mapping imagery is almost certainly being used to create a Google Maps "Street View" competitor. Apple Maps vehicles are also taking photos of businesses and storefronts in major metropolitan areas to replace current imagery provided by third-party sources such as Yelp. Apple has also updated its Apple Maps vehicles website with a new list of locations where it will be collecting data between July 1 to July 14, with notable additions including New Orleans and unmapped areas in Santa Clara County. Apple may also be at least temporarily finished collecting data in multiple states it has canvassed over the past several months, including Arizona, Florida, Georgia and Hawaii. It's fine that the van is aluminum, but it should be unibody and in three different colors: silver, space grey, and gold. The UK vans are made of aluminium. Thanks guys! Great way to start off a discussion about Apple Maps. Snarky remarks. How about celebrating the fact that Apple is making strides to work on the mapping issues people so humbly complain about here often? Did you just respond to our 'snarky remarks' with a… snarky remark? Although one of those directly mentioned Apple needing to catch up, the others were vaguely humorous and could be considered celebration—but I'm not sure what kind of celebration you're looking for. Ugly van. Steve would never have allowed this. Mercedes Vans are much nicer than those Dodge things. Although this is the old version of the Mercedes Van Apple is using, the new one is much nicer. Theres a heck of a lot of catch up work to do..
Solihull, England, approximately two hours northwest of London. or 20 minutes southeast of Birmingham. Why does the whole of the UK have be referenced from London?? Might hang a banner from my window saying "Hello Apple Maps!" or "Android < iOS" and see if I can spot it whenever Apple's version of street view goes live. While camera-equipped fifth-generation Dodge Caravans ('//www.youtube.com/watch?v=GONB3cezusI') have been used to collect mapping data in the United States, Apple appears to be using second-generation Mercedes-Benz Vito vans in Europe. Ooh, we get Mercedes. Classy.